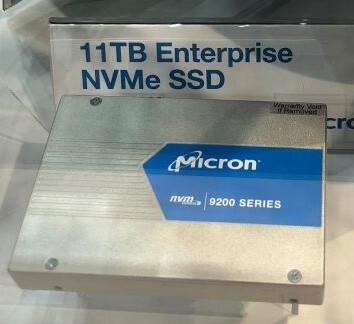 The 11 TB NVMe SSD is part of the new 9200 ECO lineup, which also features 8 TB capacities and PCIe x4 / x8 variants. These SSDs come in a more exotic form-factor known as the U.2 that is specific to enterprise servers. Micron states that the PCIe x8 versions can perform up to 5.5 GB/s sequential reads and up to 3.5 GB/s sequential writes. The 9200 family of NVMe U.2 SSDs was released earlier this year, but Micron just expanded the lineup with two new models, presented at SC17 trade show. These are the 8 TB and 11 TB 9200 ECO U.2 SSD models that come in PCIe x4 and x8 versions. The U.2 form-factor is used in enterprise servers and is bulkier than normal SATA SSDs. Aimed at write-intensive applications, the 9200 ECO models have an endurance ranging between 11.7 - 16.1 Petabytes. The PCIe x4 versions performance stats include up to 3.35 GB/s sequential read speeds and 2.4 GB/s sequential write speeds, with 800K IOPS random reads and random writes that range between 95 – 110K IOPS. The advanced PCIe x8 models can get up to 5.5 GB/s for sequential reads and up to 3.5 GB/s for sequential writes, while the random reads and writes go up to 900K IOPS and 12K IOPS, respectively. All the 9200 ECO SSDs come with special features like 32-layer 3D TLC NAND memory, Flex Capacity, power loss protection, end-to-end data path protection, and also feature 2 million device hours mean-time-before-failure. Micron did not provide any availability or pricing information for the time being.